Warner Music Canada is pleased to announce the release of Enya’s latest album Amarantine, her sixth album and follow-up to her 13 million selling A Day Without Rain. 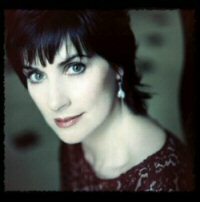 Recorded in Ireland, Amarantine is classic Enya and once again, the record is a product of the extraordinary and long-standing creative partnership Enya has enjoyed throughout her career with producer/arranger Nicky Ryan and lyricist Roma Ryan. From the soaring choruses of the title track to the exquisite nuances of Wild Violet based on a haiku by the Japanese poet Basho, everything you could want from an Enya record is here in abundance. Lyrically, however, you will find one or two innovations. In the past, Enya has sung lyrics written for her by Roma in Gaelic, Welsh, Latin and Spanish, as well as English. This time there is no Gaelic. But in addition to the song in Japanese, Enya sings three songs written in a customised language invented by Roma. The idea arose after she'd written lyrics in Elvish when Enya was invited to sing the theme song for The Lord Of The Rings - The Fellowship Of The Ring soundtrack, at the personal request of director Peter Jackson. With more than 65 million album sales to date, Enya is one of the world's biggest selling artists. A Day Without Rain was released in 2000 and became her biggest selling album to date, staying on the Billboard album chart for over two years. In 2001 two of Enya's songs May It Be and Aníron appeared in the film The Lord of the Rings - The Fellowship of the Ring. Enya, Nicky and Roma were all nominated for an Oscar and a Golden Globe for May It Be. Now comes Amarantine, Enya's most rounded and fully realized work to date, music that is as timeless and enduring as the amaranth itself, the mythical flower that never fades.